Laura Gibbs at Bestiaria Latina Blog collects proverbs in which the Latin word umbra (shadow, shade) appears. From umbra are derived a number of English words, such as penumbra, somber, sombrero, umbrage, and umbrella. We use the umbrella to protect ourselves from the rain (French parapluie, German Regenschirm) and also from the sun (French parasol, German Sonnenschirm). But the ancients seem to have used it almost exclusively to shade themselves from the sun. The Greeks called the umbrella σκιάδειον, σκιάδιον, or σκιαδίσκη, the Romans umbraculum or umbella. Embedded in all of these Greek and Latin words are roots denoting shade. 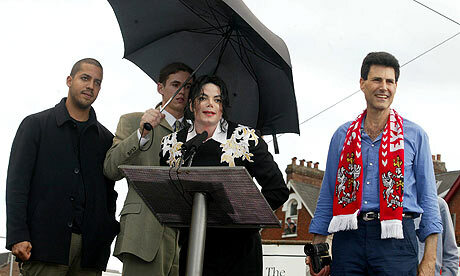 First, although it's not raining, Michael Jackson is using an umbrella to shield himself from the sun, on the advice (it is said) of his dermatologist. This was also the chief use of the umbrella among the ancients, for protection against the sun. The Athenians committed another excess. Having had good fortune they failed to exploit their luck sensibly. They obliged the daughters of resident aliens to carry parasols to shade their own girls in processions, and similarly the wives for their own wives, while the men had to carry the trays with offerings. Before you enter the city [Triteia] is a tomb of white marble, well worth seeing, especially for the paintings on the grave, the work of Nicias. There is an ivory chair on which is a young and beautiful woman, by whose side is a handmaid carrying a sunshade. Lygdus, may you carry a one-eyed mistress' sunshade. He is carrying an ivory umbrella, / like women do. σκιαδίσκην ἐλεφαντίνην φορεῖ / γυναίξιν αὕτως. The explanation for this is, I think, simple. It was the ideal for an ancient Greek woman to have a pale complexion, but for a man to be sun-burned. Women were supposed to stay inside much of the time, men outside. Women were supposed to wear clothes, whereas men were practically naked for some outdoor activities (athletics, farming, etc.). Umbrellas helped women keep their skin pale, and therefore a man who used an umbrella to protect his skin would end up not tanned (as a manly fellow should look), but pale (like a woman). For more on pale skin among the ancient Greeks, see here.